In my Intermediate Mechanics class, we’ve been talking about gravitational potential. Gravitational potential is a nice mathematical way to describe the effects of gravity on an object. You can get an idea of how gravitational potential is related to gravity by imaging a ball on field of rolling hills. The potential at a given point is the height of the ground. The gravitational force can be determined by calculating how the ground varies. If ground is perfectly flat in some region, then a ball placed there would remain at rest, so there is no gravitational force. If the ground decreases in height as you travel eastward, then a ball placed in that region would roll eastward, thus there is a gravitational force in the eastward direction. 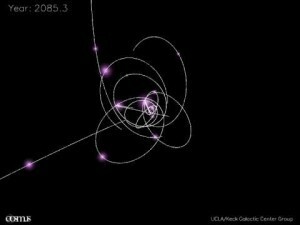 Gravitational potential can also be useful in visualizing gravity. In the figure below, I’ve plotted a contour plot of the gravitational potential around two orbiting bodies. 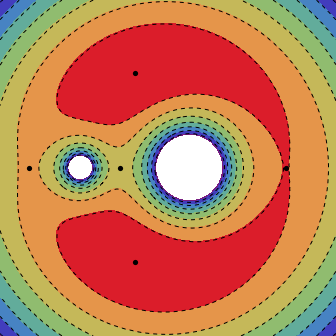 This contour plot is similar to a topological map where each dotted line represents a uniform potential. I’ve also plotted dots where the potential is flat. These are points where the gravitational and rotational forces just cancel out, so that the effective force is zero. You might imagine that there would be just one such point. It would lie between the two masses right where the pull from one mass is balanced by the pull from the other mass. While that is one of the points, it turns out that there are 4 others. Together the 5 points are known as Lagrange points. Two of the points (the ones in the red region on either side of the masses) are actually quite stable, and they can even capture small masses. The trojan asteroids that lead and trail Jupiter are an example of such captured objects.